Please read the main Import Your Data page first. If you are currently using another software program, contact us and if we have exporting steps we will send them to you, and then STOP HERE as you may not need to do this page. Otherwise, follow the instructions on this page. You may send us your own custom spreadsheet, OR, you may use our Jackrabbit Importer spreadsheet by going to Tools>Import Data>Download Importer Spreadsheet and following the instructions on the "Instructions" tab in that file. 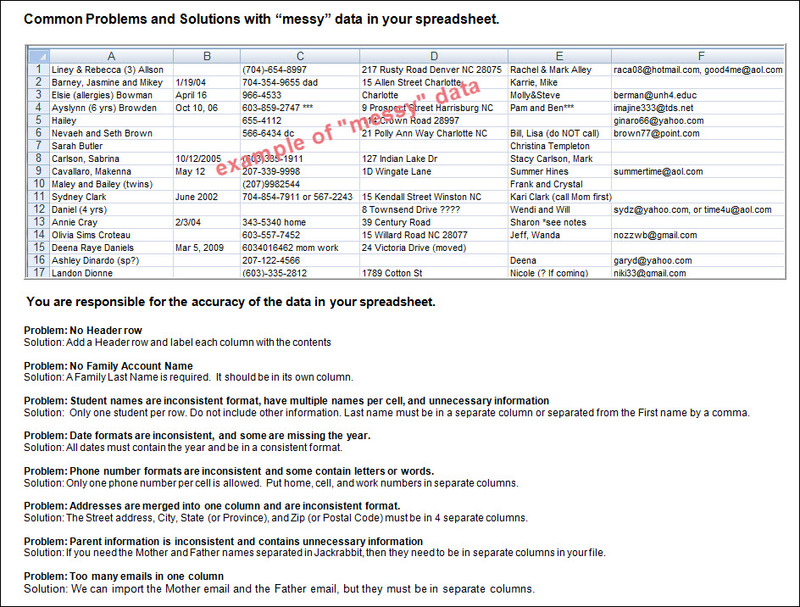 For the Free Basic Import, we require your data be in a spreadsheet format (rows and columns such as Excel). We can not work with Word documents nor scans of forms. You are responsible for the accuracy of the data in any files that you send to us. 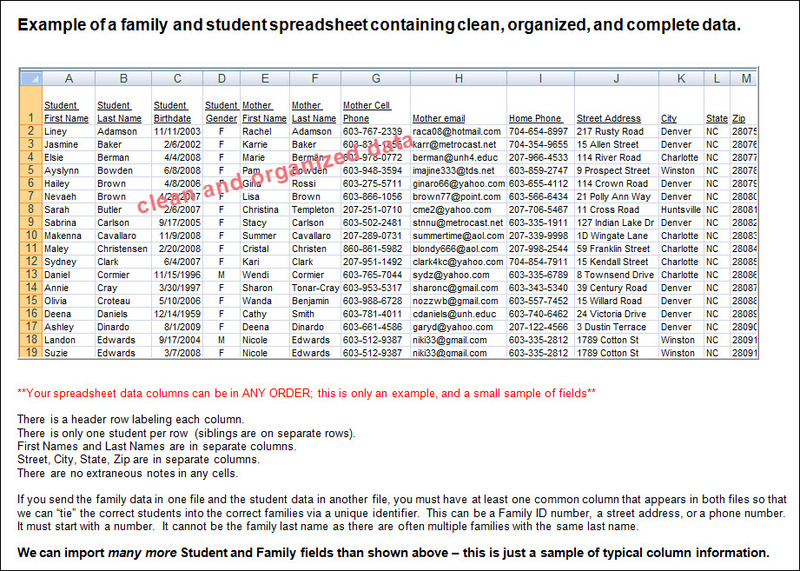 Below are several examples of what is considered "clean" data. Please review your file carefully, ensuring your data is clean and complete, BEFORE sending it to us. 1. Row 1 must be a Header with each column clearly labeled as to the contents. 2. Data should be one student per row. 3. If you are including the student birthdays in your file, you must create your Immunization schedules before we can do the import. In your database, go to Tools > Edit Settings > Immunizations/Reqs. Add each Immunization (DTaP, Hib, etc) and any Medical Requirement (such as a physical) which will be tracked. The Due fields are the number of months since birth that the immunization should be completed. See Create Immunization / Medical Requirements. 4. A Contact name (Mother or Father first name) is required if you are including their email, cell phone, or work phone. If you do not know the parent first name, you can use "X" or "Ms" as the first name. 5. If you are sending the Family information in one sheet or file, and the Student information on another sheet or file, you must include a Family ID in both files for us to be able to "tie" or "link" each student into the correct family. Often we can use the phone number or street address if it is in both files and is a perfect match. We can not use the last name as a link. 6. All names should have First Name and Last Name in separate columns, OR, be separated by a comma (such as Smith, Lisa). 7. Street Address, City, State (Province), and Zip (Postal Code) must each be in separate columns, OR, each be separated by a comma (such as 123 Big Road, Denver, NC, 28027). 8. All data will be assigned the default Location code in your database UNLESS you specify a different Location code in your files. 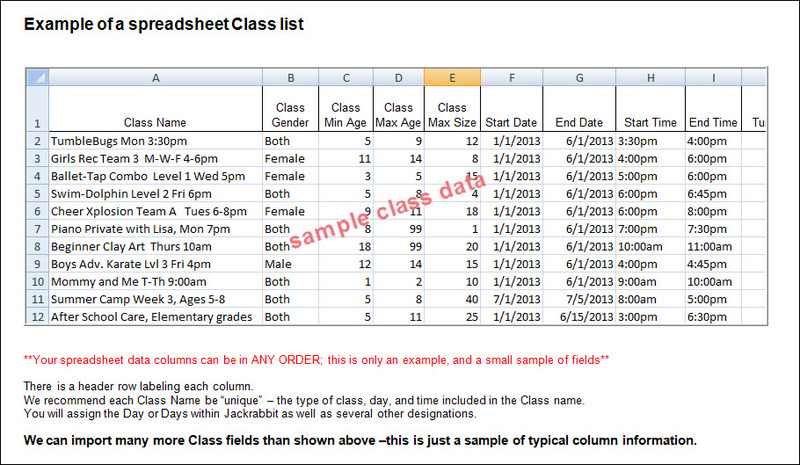 If you are sending us your Class data, it should include a descriptive class name and basic information. Please reference the Add Classes Overview page for class naming conventions. 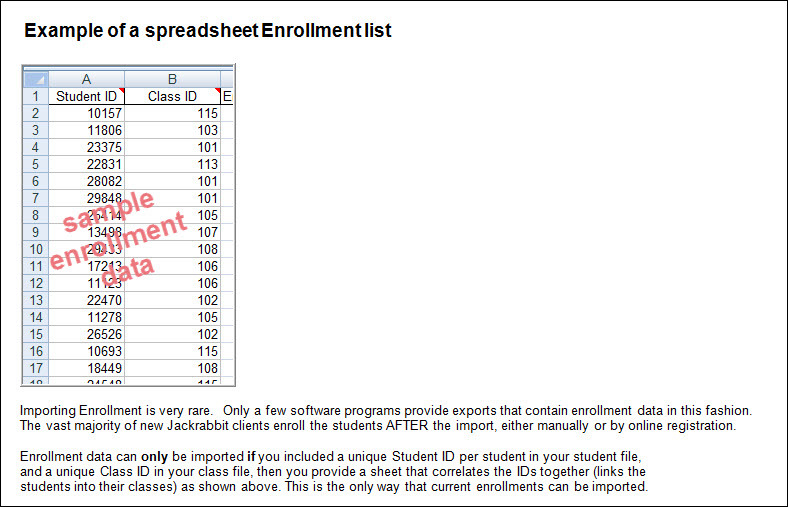 Note that the vast majority of new Jackrabbit clients do not import their class list, but instead create their classes directly in the database. Enrollment data (which students are currently enrolled in which classes) can only be imported if your Student file contains a numerical Student ID per student, and your Class file contains a Class ID per class, and then you include a sheet that correlates the student and class ID's matched containing only one "enrollment" per row. This means if a student is enrolled in multiple classes, a separate row is required for each enrollment. If you are using our own Importer Spreadsheet, this is explained on the tab called "Instructions". If you are using the Store module (point-of-sale), you can send a spreadsheet list of Items and Vendors. 2. 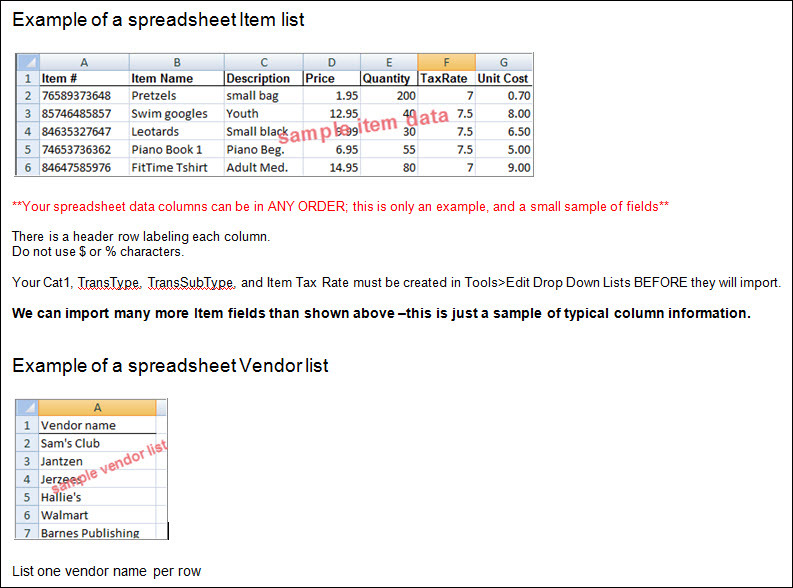 Data must be one item per row and a unique Item # is REQUIRED for each item. 4. Price should NOT include the $. 5. Item # is a REQUIRED field for every item and is limited to 15 characters. 6. If including Cat1, TransType, Trans Sub-type, and Item Tax Rate, these values must be created in your Drop Down List Editor in your database BEFORE we can import and these values in your spreadsheet must match exactly in spelling, spaces and case (lower or uppercase). 7. Item Name is limited to 50 characters. You can import Skills/Levels and Subskills that can then be added to specific classes. 2. You can download the importer spreadsheet to use under Students > Skills/Levels and click on the Import Skills/Levels button. 3. Data must be one skill or subskill per row and a unique name is required for each Skill/Level. 4. If importing subskills, the main Skill/Level must be listed on its own row first, with the subskills then listed in their own rows separately (see sample below). 5. Descriptions can only be imported for the main Skill/Level (not subskills). 6. Video links can be imported for both Skills/Levels and subskills. Questions on what you see above? Contact our Import team at Imports@JackrabbitTech.com.